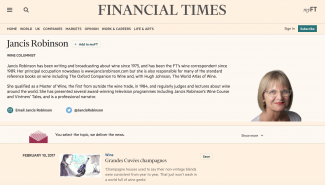 Just before Christmas, we hosted a variation of our favourite type of event (a blind Champagne comparison), for Jancis Robinson MW here at The Finest Bubble. The tasting was primarily a comparison of five Krug Grande Cuvée editions from different base vintages, with some Krug vintages and an English sparkling thrown in for good measure. We had a few surprises for Jancis and the tasting revealed some very interesting results. Jancis’ thoughts are published on jancisrobinson.com as a free article here, a more in-depth article here and also in the Financial Times here.